jkkmobile: Sunday evening and umpc? 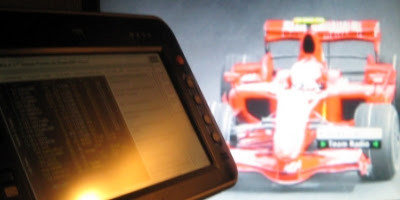 Formula1, final race for the season... Best race ever... Live timing from umpc while watching... And the winner for the race and championship is Kimi Räikkönen from Finland !! UPDATE: Looks like I wasn't the only one using online F1 services. Finnish internet traffic hit it's alltime record at the time of the race, being 33% more. Streaming sport events and live data seems to attract more and more people.